The ProForm Pro 9000 is one of the best treadmills under $2,000. While it is outdone in a few ways by the SOLE F85 and NordicTrack Commercial 2450, it is still a quality treadmill. With a large 4.0 CHP motor, this treadmill is up to being used daily by multiple users. There are 40 workout programs on the Pro 9000 with 3 levels of difficulty so people of all different fitness abilities can utilize the workout programs. Depending on if you can live without a couple of features the Pro 9000 lacks, we would recommend this treadmill for anyone looking for a quality treadmill. The Pro 9000 retails for $2,999 with a regular sale price of $1,999. Like to mix speed with inclines - Users who want a mix of speed training with their hill training will like the Pro 9000. With the ability to go -3% decline, up to 15% incline, and speeds up to 12 MPH, users can enjoy tough training from the comfort of their home. Need space to work - The Pro 9000 is built with the user’s comfort in mind. A tablet holder is mounted above the console and there are two water bottle holders located on either side of the console. There is even an extra device holder located below the console in case users need more space. Want a high-tech treadmill - While the less expensive ProForm treadmills aren’t very tech-oriented, this isn’t true of the Pro 9000. With its 10” touchscreen, web-browsing capabilities, iFit connectivity, and wireless heart rate monitoring chest strap, the Pro 9000 is packed with features. The Pro 9000 is a tough, sleek machine which almost lures the user into working out. Our testers enjoyed it, and when stacked up against other treadmills in its price range, the Pro 9000 held up well. Great price for a quality product - For under $2,000 the Pro 9000 is packed with features. Smart console layout - The speed and incline buttons are located under the 10” touchscreen, within easy reach of the user. This makes a huge difference when you are sweating, running, and want to slow down. Some console layouts like the Horizon Elite T9 do not take this common situation into consideration. Plenty of workout options - Users can utilize the 40 workout programs to keep themselves challenged while using the Pro 9000. If the iFit connectivity is included, then users can expand the already great options this treadmill offers. Motor Size - The motor in this treadmill is 4.0 CHP. It is a strong motor so it can easily incline and decline smoothly with minimal noise. With a powerful motor, the Pro 9000 is up for daily use by multiple users. Running Area - The running belt area is 22” by 60”. This is the average belt area for this price range. Weight Capacity - The Pro 9000 can hold a user who weighs up to 300 lbs. It doesn’t have the high weight capacity of the F85, which can hold a user weighing up to 400 lbs. So if you need a more heavy-duty treadmill, you may want to look at the F85. Folding - This treadmill has the ability to fold up and has EasyLift™ Assist technology to help you fold up the deck easily. Space / Footprint - The Pro 9000 measures 39” wide, 70” long, and 77” high. When folded, it is still a bit of a space hog and not too easy to move. This treadmill would be best in a dedicated space in your home where a large folded up treadmill won’t be a problem. Max Speed - The treadmill’s max speed is 12 MPH which is standard for most treadmills. Incline - This treadmill has an incline range of -3% to 15%. While the Commercial 2450 has the same range as the Pro 9000, the F85 does not. So if you want a good range of incline, the Pro 9000 is a good option. Workout Apps - There are 40 workout programs which are pre-programmed into the Pro 9000. With beginner, intermediate and advanced programs, people of all fitness levels can find a program to suit their needs. Display - The Pro 9000 comes with a 10” touchscreen with high-definition quality. You can browse online once you connect the treadmill to your Wi-Fi, and also utilize the iFit app from the touchscreen. When working out, the screen can display your time, speed, calorie burn, distance, incline/decline, and heart rate. The screen is very responsive to even light touches, so you can scroll through your workout data and online with ease. Speakers - There are two, 3-inch speakers located at the base of the Pro 9000 console. The sound is crisp and has a good sound range. The quality deteriorates a bit at the highest volume levels. Fans - Runners and walkers alike love the position of the Pro 9000 fan. The fan is mounted under the console in a fixed position pointed toward the user’s core, directing the cooling breeze where it will do the most good. It has two speeds depending on your needs. Heart Rate Monitoring - The Pro 9000 has two ways to monitor someone’s heart rate: EKG handlebar grips and a wireless chest strap. The handlebars are not very reliable, which is true of most treadmills we’ve tested. However, the wireless chest strap is adjustable and on a comfortable band which is fairly accurate. Customer Support - ProForm has multiple ways to provide support for their customers. There is a live chat function on their website, a help request form, phone support and email options available to answer customer questions. Return Policy - ProForm offers a 30-day trial period which you can return your product for a full refund, minus a 10% restocking fee. If your product is damaged or defective, you do not have to pay the restocking fee. The Pro 9000 is built for a wide range of users. Its ProShox™ Cushioning reduces impact for walkers and runners alike but isn’t so squishy that runners are unprepared for outside running. The warranty on the Pro 2000 is pretty generous. While many treadmill warranties offer lifetime warranties on the frame and motor, the -year parts and 2-labor warranty are longer than your average treadmill warranty. In the under $2,000 treadmill category, competition for the spot of the best treadmill is fierce. While the Pro 9000 is a great treadmill, there are a few ways that it is lacking compared to other treadmills in its price range. These factors may not be something you care about when it comes to treadmills. So depending on your treadmill dealbreakers, the Pro 9000 may be the right treadmill for you. While third-party treadmill distributors may claim to have better deals, it is best to buy directly from the manufacturer when it comes to buying your treadmill. 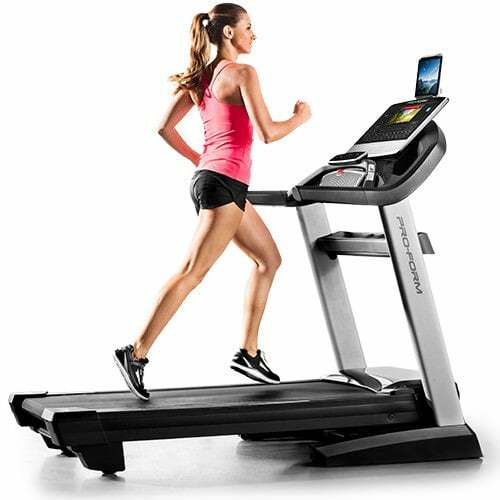 Buying from ProForm’s website will ensure you receive the latest treadmill model, the best price, and far superior customer service.